Hair extensions have been a big hair trend for many years now. With such a large and growing market it’s hard to sort out who is legitimate and who is not. There are many questions you may ask yourself when purchasing hair such as what is Remy hair? What is virgin hair? And why are there so many different origins of the hair? It is very important to do research on the hair you’re looking at especially with it being such an investment. With installation running from $150 to $400 there is no room for mistake. What is Remy Hair? It's simply human hair that has its entire cuticle intact and running in the same direction. The hair cuticle is the outermost part of the hair shaft. It is formed from dead cells which form scales that gives the hair shaft strength and provides protection. The cuticle gives the hair a natural luster and helps retain moisture. Hair naturally grows in a unidirectional fashion, therefore the way Remy hair is made prevents tangling and matting. Why is that important? Because no matting and tangling means less shedding! What is Virgin hair? Virgin hair is hair that is completely natural and unaltered. It has never been permed, colored, relaxed, or chemically altered. This allows the hair to be at its healthiest state which will prevent breaking from weakened or damaged hair shafts. Not all virgin Indian Remy hair is created equal. Some of the hair is old, damaged and dry but it is marketed as top quality hair extensions. It is coated in a chemical named dimethicone , which leaves the hair feeling excessively silky and slippery. However, the deception will only last a short time. Often, this hair is on a poor quality weft and very thin at the ends. A less than satisfactory repair requires the removal of inches off the ends. You will never find this type of hair at International Hair Company; we take pride in our reputation. What Country is my hair really from? In more recent years, companies have come out selling Brazilian, Russian, Peruvian, and Malaysian hair. Although it may sound luxurious and exotic we must not be fooled by these marketing tricks. All hair originates from China and India. Prior to any of these new hair types coming out these two countries were the leaders in human hair industry. When was the last time you saw a Brazilian woman running your local beauty supply or a bald Russian woman walking around? With over 28 years of experience, we know how to find the best quality, long-lasting Indian Remy hair. We select lustrous, full-bodied hair that has natural movement to give you the perfect look every time. We ensure the quality of all our Remy hair lines by selecting from the healthiest hair possible with undamaged cuticles, an indicator of good care and vitality. To prevent tangling and retain body, we always use Indian hair that is unidirectional and full from the weft all the way to the ends. We are confident you will appreciate our ability to recognize quality for all your hair extensions and weave. 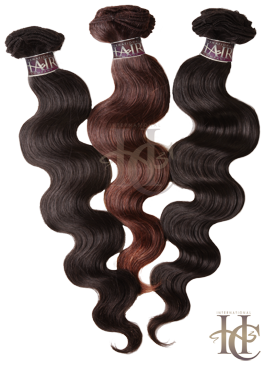 You will love the Quality of our virgin remy hair extensions! We Guarantee it.